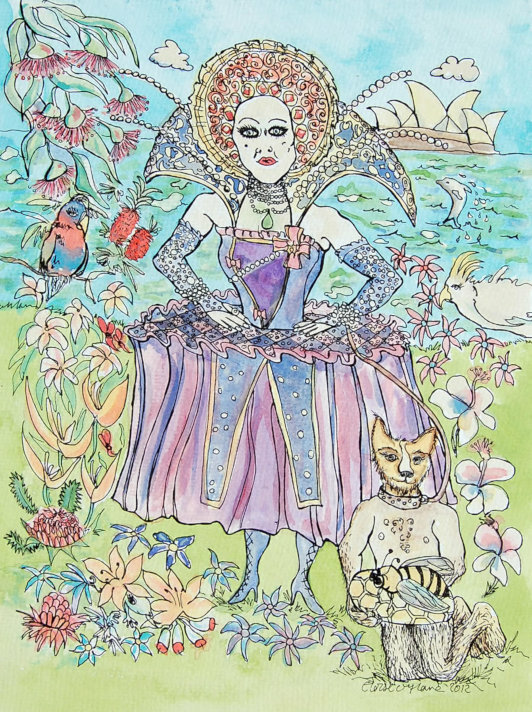 A painting of Mitzi Macintosh dressed in her Royal Queen costume. A painting of Mitzi Macintosh dressed in her Royal Queen costume and with her boyfriend dressed as a faithful dog holding a bee and honeycomb, symbolising her Queen Beeness. In the background is the Sydney Opera House and Sydney harbour with cockatoo birds, rosellas, a bottle-brush tree, frangipanis, bluebells, waratah, lilly pilly flowers and a bird of paradise. Mitzi is an icon of the Imperial Hotel in Sydney where Priscilla Queen of the Desert was filmed. The picture has a black frame. If you'd like another frame, please leave a note in the checkout and I'll let you know what other frames I got available.